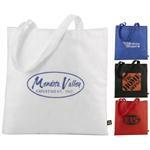 Laminated Wipe Off Large Shopper Tote Bags and trade show totes. 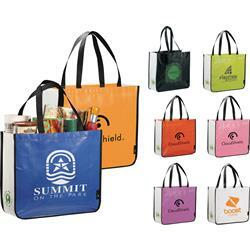 These custom printed tote bags are very popular as the eco friendly bag choice of grocery stores, other retail outlets and as a trade show bag. Reinforced handles and binding for added durability. 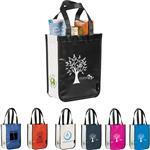 The pre-printed designs supports environmentally-friendly promotions. Made from 100% recyclable material (exterior label affirms this claim). 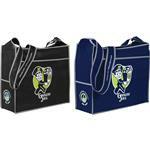 Laminated material water resistant and hand- wipe able. Ideal for shopping and beach trips. Custom design available at higher quantities with overseas production. 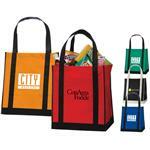 A popular shopper and trade show tote. Dimensions: H 14" x W 6.5" x L 16". Typical Imprint Area(s): L 7" x H 6" on grass print bag. 8" x 8" on black bag. 110gLamNWPP tote bag. Made from 100% recyclable material (exterior label affirms this claim). Laminated material water resistant.